Press release from The Old Barn Nursery and Old Barn Pre-Prep. 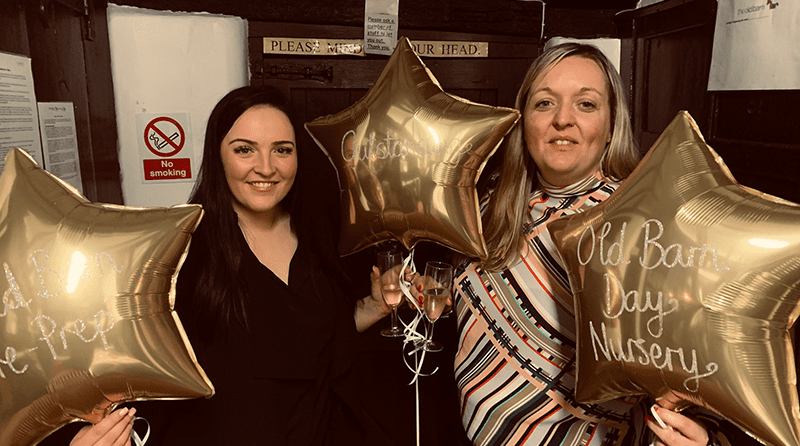 Friday, the 1st February, saw an evening of entertainment and celebration as the Old Barn Day Nursery, Old Barn Pre-Prep and over 50 members of the local community in Banstead celebrated the ‘Outstanding’ outcomes following the nurseries’ inspections by education watchdog, Ofsted. Both nurseries were inspected within a week of each other and both achieved Ofsted’s highest grade. Parents and members of the community attended the Old Barn Nursery in Woodmansterne Lane to join with the staff from both settings to share in the festivities, as internationally recognised harpist, Tomos Xerri entertained guests with a mixture of classical pieces and his acoustic takes on modern hits. Tomos congratulated both managers for their achievements. Kelly Walton, from the Old Barn Day Nursery, gave a heart-warming speech thanking the parents for being “the first educators in their children’s lives”, and “both nursery teams for their hard work, dedication and passion in making all children’s experiences ‘outstanding’”. Jodie Arnold, from the Old Barn Pre-Prep, echoed Kelly’s comments, saying, “I am so proud of my team and the hard work and commitment they give to ensure that each and every day for the children is an outstanding one”. If you are looking for childcare and would like to visit The Old Barn Nursery or Pre-Prep, please contact 01737 373715 or manager@oldbarndaynursery.com for the Nursery, or 01737 353523 or manager@oldbarnpre-prep.com for the Pre-Prep. Or alternatively, the Nursery and Pre-Prep are hosting an Open Day from 10am – 3pm on Saturday 16th February.